« The Six-Word Festival on Twitter! Sept. 24-26—With Katie Couric, Tim Gunn, Todd English, Jane Pratt, Tim Ferriss and More! Karen first discovered Six-Word Memoirs in 2011 via a Facebook post and was immediately hooked. “Barefoot, never (again) pregnant, dislike kitchen” is an early favorite, and her love of wordplay (“Dislike chaos even in theory”) has flourished since. 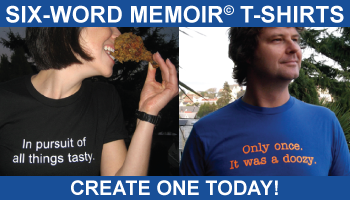 Courtesy of our friends at Spreadshirt, we know Karen will pick a great six for her Memoirist of the Month T-shirt. Read more about Karen and what makes her one of the Six-Word community members who make six tick. I honestly don’t remember when I started writing. I kept a journal as a teenager and back in the day, in addition to passing actual notes—not 140 character texts—in school, I also wrote a lot of letters to my camp friends—I grew up outside of Chicago, but went to a creative arts camp in Connecticut. It was fun (in an excruciating kind of way) to find all those notes and letters while helping my parents move out of my childhood home. One of my favorite Six-Word Memoirs, “Writer in search of a plot,” marks a creative turning point. I remember being in Mrs. Lowey’s creative writing class my senior year of high school—a much-coveted privilege—and learning that I could not plot anything. Everything I wrote, including some really bad poetry, was a first person narrative/opinion piece. Eventually Mrs. Lowey had us interview a classmate and write their story. Voila, a plot. In college, I worked on the school paper and eventually became the news editor, reporting didn’t require me to create a plot, just the facts, ma’am. We were thrilled to include your Golden nugget “Every Meal is a Seinfeld episode” in our recent book, Six-Word Memoirs on Jewish Life. Tell us more about your faith, your family, and your memoirs. Oy. As a member of “the organized Jewish Community,” I like to say the Jewish community is more Jewish than organized. 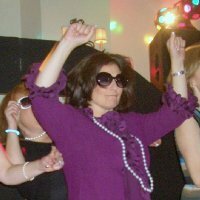 On the side, I am a fundraiser for The Jewish Federation of Greater Philadelphia: I sell hope. Living in Cherry Hill, New Jersey (an edge city of Philadelphia) and working at the Jewish Federation gives me a wealth of material for “Six Words on Jewish Life.” New Jersey is pretty much divided between the part that is a suburb of New York and the part that is a suburb of Philadelphia. It is rough country for my boys who are NY Giants fans, but we manage. My husband Brad and I have been married for 22 years (gasp). 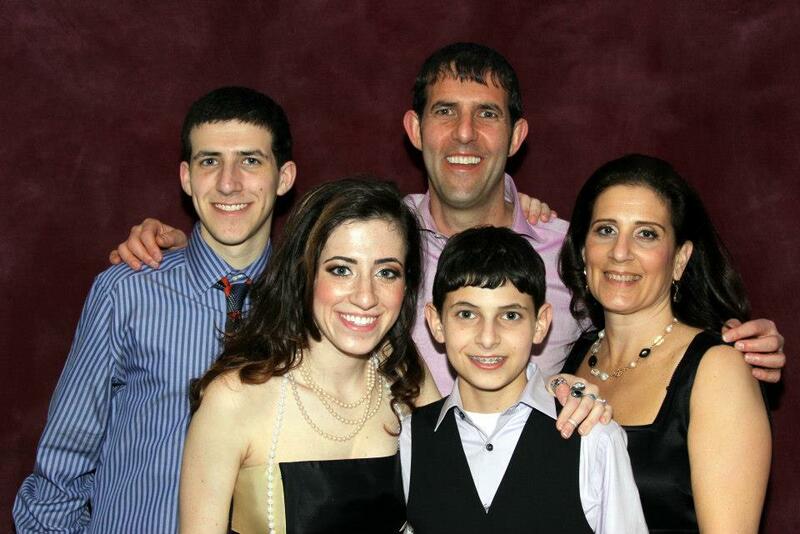 We have three children: our daughter (19), a sophomore at Ithaca college, and two sons (16 and 13). I anticipate many angsty college-related Sixes in the upcoming year. Tom Robbins and John Irving, when I was younger and liked my wisdom with a dose of whimsy. Margaret Atwood, Joyce Carol Oates, Anita Shreve and Alice Hoffman…and a bunch of other smart women I am forgetting…when I was struggling with the story of my life. I’m still struggling, but I am resigned to making it up as I go along. Although I generally don’t like short stories, I love Ellen Gilchrist. Too many to count. When the “Questions” section of Six first went up, I answered this and was much more mortified about the people I left out than pleased for those I’d remembered. I love that Six Words is truly a community. I love that people come and go, and I especially love that people stay. I love low-profile writers and readers and I cherish the interplay and feedback found in the comments section. It’s a great community and a wonderful place to me to “work things out.” I am proud to say that I’ve achieved “regular” status on the wayward route of our itinerant unofficial ambassador/den mother, L2L3. My hobbies are children and laundry and, as I often say, it’s good thing they go together so well. Finally, Karen Golden, what’s your Six-Word Memoir for today? Six words, the world’s best sandbox. Congrats on Memoirist of the Month! Insert feigned surprise here…not;-P It is much deserved and I’m thrilled (probably more than you are) to see you in the spotlight. Love the photo of you and the rockin’ beads. Oy AND Ay-Yi-Yi!!! congratulations on a well deserved feature and it was great to read about your life and career. What a good looking family! Much deserved honor for such a humble person. What a great pleasure to meet you, notjust. Lovely interview, great pictures. I love your writing. You inspire me. Congratulations - well-deserved recognition. Dear Karen, it sure was great to learn more about you. My hunch that you must be a fascinating person was true! Wonderful to meet you! You are such a creative Sixer and a fantastically supportive presence on the site. I loved reading more about you! Congratulations on your feature, you’re a great member of this community and we’re glad you’re here. Hey, Cherry Hill is half an hour away from me! What a fantastic (and well-deserved) member feature! You’re as interesting a person as I’ve imagined. Congratulations on getting the spotlight treatment, and thanks for being willing to share of yourself so that we might know you a bit better. Kudos! There you are, girl. Featured and dancing! So happy to learn such interesting tidbits about ya. As you already know, I love your memoirs, especially the ones about your mom and dad. Your back stories often leave me crying (in a good way). Nice family portrait! Keep writing and dancing. Looking forward to more gems from you. Well, look at you! It’s about time!!! Congrats! I love your acerbic wit and your ability to perfectly capture every thought in exactly six perfect words. It was a pleasure learning a bit more about you and your family. Mazeltov on the feature, Karen! Great to ‘meet’ you and learn more about you and lovely to put a pretty face to the moniker! Love what and how you write, especially the interplay bantering back and forth - keep ‘em coming!! Enjoyed your “bio” very much! You are one of my top favorites (no secret :-). Direct, brilliant and funny. Always enjoy your sixes and backstories especially about your dad. You are making me blush (not easily accomplished I assure you!) Thanks for the kind words, great company and inspiration. Six really is the best sandbox will all the best people. So glad to read your story. Love your sixes and look forward to reading more! Your definitely one of the more intelligent, complex and (dare I say it- dark) contributors on this site. Keep up the good work. How wonderful it was to see you featured when I opened SmithMag this morning. Congratulations on the deserved recognition and keep ‘em coming! Always love your memoirs and comments. Congratulations! Beautiful lady, inside and out! I love that you make time to share your talent with us in spite of a full and over flowing calendar. So fun to learn more about you…I feel the same about “working things out” here. Your sixes keep me coming back for more. It was so wonderful to read about you. Congrats on being MOTM! I am running over with my pail and shovel. You always make the sandbox fun. Oh oops those question marks were a smiley face - not sure what happened but will try this…. Congratulations, Karen. You are definitely notjustagirlintheworld, you are a presence. It is such a pleasure to read you and interact with you in this place that I agree is the best sandbox in the world. So good to meet you this way!! what a gorgeous family and what an inspiring story! It was so great learning more about you, my friend, and seeing your pretty face. You are such a solid and supportive part of this community - it would NOT be the same without you!!! Wonderful to learn more about you. Your comments and support on my memoirs mean more to me than you could ever know. I love putting a face to your name now. Congrats on memoirist of the month! if your web hosting is OK? Not that I am complaining, but slow loading instances times will often affect your placement in google and could damage your high-quality score if ads and marketing with Adwords.